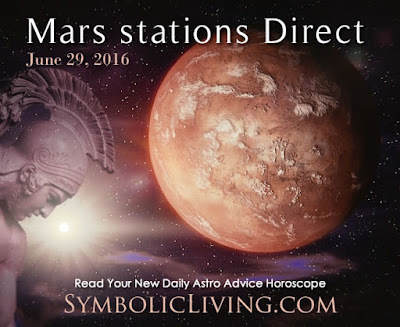 Mars stations Direct in Scorpio today! This can be a turning point for many of us. Life is likely to start picking up steam. While Mars has been retrograde it could have been pretty tough for a lot of us. June has been a month of changes. The crossroads at the beginning of the month set the stage for much to come. The need to get rid of unwanted behavior from ourselves or others, has been in focus. With Mars slowing to a standstill then heading direct in such a strongly emotional sign, Scorpio, the tension could come to a head. However, it's also possible that today the past could decidedly dissolve away as you're ready to let go of any negativity so you can move forward with more personal power and strength. A resolve to change, to fix problems and move forward is with a lot of us now. If you've dealt with a lot with the changes this month, this could be when you realize for sure that it's time to prepare head forward with renewed power. Those of you working through emotional or psychological issues, could find this is the turning point you need to change the way you act and react to others. This could also be when secrets that were revealed, or discoveries you made, sometime over the past month or so, now has you sure of where you stand. What people behave like behind the scenes, especially when under pressure, can be much different than what we'd expect. It's a good time to take at, and address, the psychological reasons behind stress, aggression and violence. What you now understand about the behavior, actions and motivations of others, and yourself, has gotten you closer to knowing who you want to be and what kind of actions you want to take in the world. New actions, new results. Mercury enters Cancer today as well. With Mercury here, emotions impact the mind more easily and vice versa. Care for yourself to be sure you can have the mental state that contributes to the better care for others as well. It's a great day to get a massage to help you balance out your physical and mental tension. Comfort food, and family meals can be a great way to connect and communicate. Overall, it's better if you are with those that tend to have a calmer demeanor to avoid any potential conflicts, especially if you feel tension in the air today. Your New Monthly Horoscope for July is coming out. Sign Up to the Newsletter for your copy.